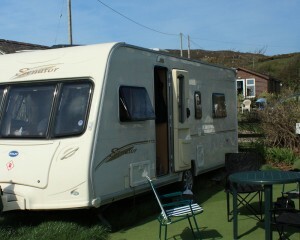 Facilities for Caravans - ..
Caravan owners have full access to all the facilities available to campers. These include ladies and gents toilets, 2 family/spacious showers and 4 shower units/rooms. Our facilities also include a disabled friendly shower and baby changing facility. We also have a new toilet block which has 2 gents and 2 ladies toilet, it is situated further down the site. This is only open during busy times. Outside the shower block there are 2 sinks for washing up with free unlimited hot and cold water. There is also a fresh water tap. There is also a fresh water tap and waste water disposal point half-way down the campsite along with a chemical toilet point. The ground is flat and well drained making it easy to pitch your van, level it up and then hitch back up after your holiday. The pitches are well spaced allowing room for a full-size awning and a standard sized car to sit alongside your caravan. Electric hook-ups (6 amp) are available for all caravan pitches.